It takes two grown men to lift one of Mustek’s custom-built PC rigs. The Johannesburg-based company builds the machines for people with a need for serious computing speed. The weight is not surprising when you consider the horsepower housed inside the gargantuan chassis. 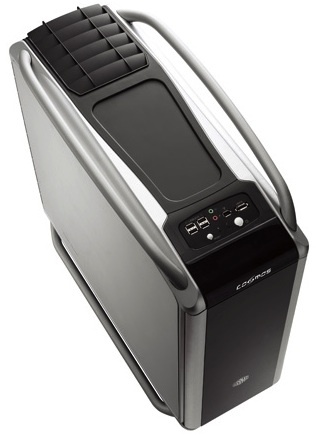 Using a custom Cooler Master “Cosmos” chassis, the Mecer Graphite-branded machine can house up to 12TB of storage (6x2TB hard drives) and, depending on the motherboard, can carry as much as 96GB of random-access memory (RAM). The machine Mustek sent us to review was a little more sedate, but still a powerhouse of performance. Kitted out with a top-end Intel Core i7 processor, 6GB of RAM, a 64GB solid-state drive to boot Windows 7, a Blu-ray drive and two ATI Radeon HD 4870 graphics cards running in parallel, this is a gamer’s dream machine. Indeed, the first thing we did was fire up some of the latest games, including Crysis, Far Cry 2, Flight Simulator X and Call of Duty: Modern Warfare 2. All ran smoothly with every graphics setting maxed out — impressive given that Crysis, for example, barely runs at all on most computers, even modern ones. However, the Cosmos machines are not aimed at the gamer market, says Mustek chief technology officer Dimitri Tserpes. Gamers tend to build their own rigs over time rather than buy pre-built computers. Rather, the target market consists of the likes of engineers and geographic information specialists who need serious computing horsepower to crunch through large datasets, Tserpes says. The machine, which runs surprisingly quietly, has no shortage of bays and ports for extending its functionality. There are five bays for optical drives, for example, and a bank of easily accessible ports at the front of the machine, including an eSata port for external storage, four USB ports, and audio jacks. There are an endless array of ports at the back of the machine, too. The machine’s performance is breathtaking. On our test machine, for instance, Windows 7 booted in under 10 seconds. Microsoft Word 2007 loaded from fresh in less than one second. He says Mustek has sold a number of high-end Cosmos machines that cost over R30 000 each.